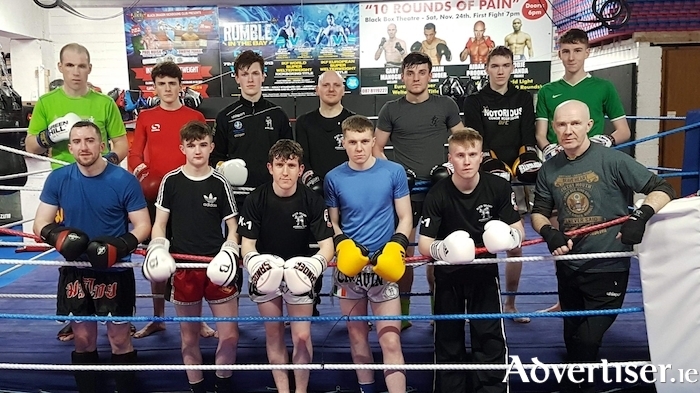 The Galway Black Dragon fighters ready for action after their last heavy sparring session.Back row, Tom Scarry (Moylough/Ballybane), Eoin Mulvihill (Ballinfoyle), Cian McCormack (Kinvara), Dara Mannion (Westside), James Kelly (Athenry), Corey O Malley (Ballybrit), Alex Fitzpatrick (Tuam).Front row: Adam Keane (Abbeyknockmoy), Ben Devlin (Knocknacarra), Sean Ryan (Cong), Damien Creavin (Ballybrit), Cian Doherty (Headford) and head coach Pete Foley. (Annaghdown). Kinvara man and Black Dragon kickboxer Cian McCormack is preparing for the biggest fight of his career on Sunday. McCormack takes on Belgian national champion Sofyen Marzouki in the Clayton Hotel for the official IKF European super lightweight senior K-1 title. Both men have opted to fight Pro Rules, which means they will fight bare shins (no padding ), and Marzouki will fly in on Saturday for the 24 hour advance weigh-in where both fighters will square off for the mandatory photos. McCormack's teammate Corey O'Malley is also in action, taking on Neil Molloy from Ennis for the vacant IKF All Ireland Junior Featherweight Full Contact Kickboxing Title. These two fighters have history with the Clare man winning by the tightest margin last time they fought, so Corey will be out for revenge with his eyes firmly fixed on the title. Another huge fight on the card will see two unbeaten 6' 4" and 17 stone men go toe to toe for the vacant IKF Senior Super Heavyweight All Ireland Full Contact Kickboxing Title. Gytis Lisinskas, fighting out of O’Neill Fitness & Martial Arts from Oldcastle, Co Meath, and Ethan Kerrins from Phoenix Kickboxing in Ennis have both promised to put on a show for the fans. The exciting undercard will see Galway fighters Tom Scarry and Sean Ryan taking on two MMA fighters from Husaria MMA in Wexford under K-1 Rules. James Kelly and Adam Keane take on two MMA fighters from Straight Blast Gym in Cork under K-1 Rules, while Dara Mannion and Damien Creavin face Limerick Hub fighters under K-1 Rules. Also in action are Alex Fitzpatrick, Eoin Mulvihill, Ben Devlin, and Cian Doherty. Doors open at 3.30pm with the first fight scheduled for 4pm. Tickets are available from the fighters, the Black Dragon Gym or a limited amount are available at the door on the day. Telephone 087-8119227 for more information.